A couple of years ago my little guy, when he was about four, became very fascinated with this story. 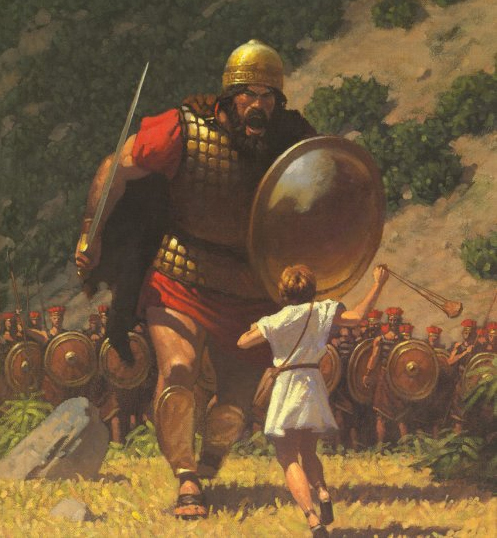 David and Goliath–only he called them David and “Cletus.” Ahem. Anyway, he loved all tales of good vs. evil, and he still does. Thus the current fascination with all things Star Wars. The thing is that he loves the bad guys. I was really worried about this until I was assured by more than one grown, law-abiding adult male that this is a normal thing. Ahhh. Huge sigh of relief. I’ve been thinking about this question a lot the past two days. I follow Confessions of a Funeral Director on Facebook. I know, an interesting choice. And Caleb Wilde is interesting. I first became acquainted with his writing when he wrote about “The Homeless Man and the Scone.” Powerful. Really good stuff. Sometimes he posts questions, like he did yesterday. I am sure that many of the folks who responded were also funeral directors, but still, it made me think. He asked: Graham Putnam & Mahoney Funeral Parlors accepted the body of Boston Bomber, Tamerlan Tsarnaev. But, the cemeteries in Mass. refuse to accept his body. How would you feel if Tsarnaev was buried in a cemetery with your relatives? Furthermore, do we believe that EVERYONE is entitled to a respectful burial? Oh boy how the responses varied and how passionate they were. Y’all may have seen similar conversations. I was so upset by many of the comments that I talked with my Aunt about this yesterday. Let me preface this by saying, I did not lose anyone in the Boston bombings, and I cannot say how or if that would change what I think. Having said that, I do not see how refusing to care for the body or to provide a burial will accomplish anything. Except more hate. Yeah, there’s that. What this young man is accused of doing is horrible, tragic, heartbreaking, and irreversible. People will be broken from this, by this, for a long, long time. I wonder though, what good can be served by perpetuating the brokenness beyond his death? What good can come from returning evil with anger? I’m just asking. Because there is that book again, the Good Book, that holds so much good in it. Many folks whom I know love this Book are forgetting some of the guidance about how to deal with evil and those we call enemies. My Mama used to talk about heaping coals of kindness on people who had hurt us or made us angry. It was something she expected us to do, and she empowered us to do it. I guess she was paraphrasing (or misquoting, who knows) Romans 12:20: “On the contrary, if your enemy is hungry, feed him; if he is thirsty, give him something to drink. In doing this, you will heap burning coals of shame on their heads.” (Okay, Mama’s was a bit different but I think she got the gist.) Proverbs 25:21 also tells us to feed our hungry enemy and give our thirsty enemy something to drink. Here’s the whopper though. In Matthew 5:44 we are told to “Love your enemies, and pray for those who persecute you.” Really? Love? Seriously? What if I don’t want to? What if they were really, really evil? I don’t think there’s a clause for that. I am moved to tears by Mr. Keane and his generosity and kindness, just as I was moved by a video from a young man in his last days saying that those two things are what count, what it is all about–being kind, being generous. What a beautiful tribute to his mother. I wish I could have met Mr. Keane’s Mama. She raised him right. I wonder if my Mama has met her and shared stories with her yet. I think they might just be kindred spirits. So Goliath…..and his Mama. I am not sure of the connection, or if there is one. Maybe just how my mind wanders. Or maybe I would like to think that this could be a compassionate side coming out in my little guy. Wondering about Goliath’s family, if anyone was upset about what had happened, if anyone missed him after he was gone. 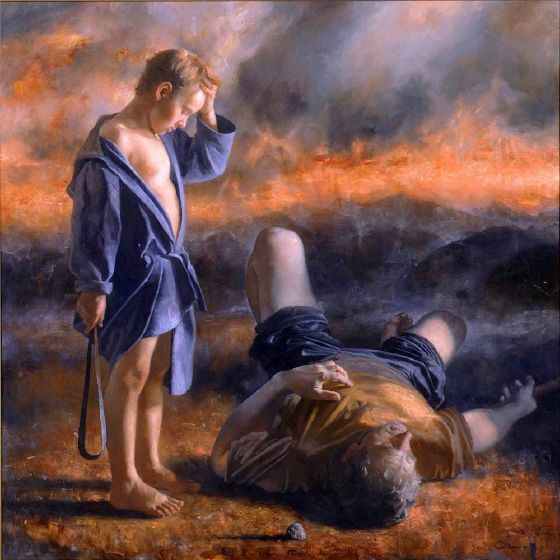 Because I came across this picture by a Russian artist–and something in David’s face makes me think about Goliath’s own story…..and that maybe David is wondering some of what my little one is wondering lately….. I really can’t be sure, but I can be sure of this. Two wrongs don’t make a right. I know it. Mama said so. Heapin’ coals. Hard as it can be, it’s the right thing to do. ← Where is the Grownup? I love your stories and the connections that you make! I always leave this page with something to think about and I truly appreciate that. That painting is breathtaking, especially the long shadow of the small stone. Thank you. For your kind words. For good conversation. For everything. I love the painting too–it breaks my heart. I found it interesting that he paints like an Old Master, but is a year younger than we are. Fascinating. If you have a minute look up some of his other paintings. Beautiful. Thank you for pointing out the shadow. I had not noticed it. I can’t get past David’s face. That’s beautiful, Tara. A reminder of the direction in which we should go and how far we have veered off course as a nation. I love your heart for others. Thank you for your sweet words, Debra. I appreciate it. I love that my children ask hard questions that make me think. Thanks for reading.